Written on 6 January 2011 . Last updated on 7 January 2011 . In light of the recent remote PHP exploit, I decided to update a couple servers I manage to ensure they weren't vulnerable. In each case, I had been using hand-compiled PHP builds, but decided that I'm simply too busy lately to be trying to maintain updates — so I decided to install Zend Server. I've been using Zend Server CE on my laptop since before even any initial private betas, and have been pretty happy with it — I only compile now when I need to test specific PHP versions. One thing I've never been happy about, however, is that by default Zend Server exposes its administration GUI via both HTTP and HTTPS. Considering that the password gives you access to a lot of sensitive configuration, I want it to be encrypted. Written on 22 December 2010 . Last updated on 24 February 2011 . My job is great: I get to play with technology and code most days. My job is also hard: how does one balance both functionality and usability in programming interfaces? I've been working, with Ralph Schindler, on a set of proposals around the Zend Framework 2.0 MVC layer, specifically the "C", or "Controller" portion of the triad. There are a ton of requirements we're trying to juggle, from making the code approachable to newcomers all the way to making the code as extensible as possible for the radical performance tuning developers out there. Written on 9 November 2010 . Last updated on 11 November 2010 . In Zend Framework 2.0, we're refactoring in a number of areas in order to increase the consistency of the framework. One area we identified early is how plugins are loaded. In practically every case, we use a "short name" to name the plugin, in order to allow loading it dynamically. This allows more concise code, as well as the ability to configure the code in order to allow specifying alternate implementations. Last updated on 30 October 2010 . 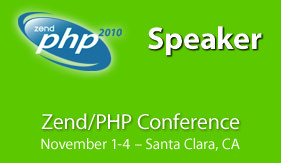 As I write this, ZendCon begins in less than a week. I have the honor and pleasure to be speaking there again, for the sixth year running. Written on 4 October 2010 . Last updated on 11 October 2010 . I had a twitter/IRC exchange yesterday with Andries Seutens and Nick Belhomme regarding applications that include widgets within their layout. During the exchange, I told Andriess not to use the action() view helper, and both Andriess and Nick then asked how to implement widgets if they shouldn't use that helper. While I ended up having an IRC exchange with Nick to give him a general idea on how to accomplish the task, I decided a longer writeup was in order. Last updated on 20 August 2010 . I'm currently doing research and prototyping for autoloading alternatives in Zend Framework 2.0. One approach I'm looking at involves creating explicit class/file maps; these tend to be much faster than using the include_path, but do require some additional setup. If the file does not contain an interface, class, or abstract class, skip it. The question was what implementation approach to use. I'm well aware of RecursiveDirectoryIterator, and planned to use that. However, I also had heard of FilterIterator, and wondered if I could tie that in somehow. In the end, I could, but the solution was non-obvious.